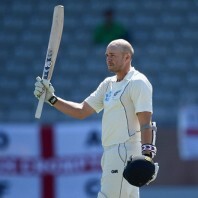 New Zealand piled up 443 runs in the first innings followed by 241 for the loss of 6 wickets when their skipper, Brendon McCullum, declared the innings. England was restricted to 204 in their first innings and they were reeling at 90 in 52.1 overs with six wickets remaining in the second. The fourth day’s play finished on Monday, March 25, 2013, at Eden Park, Auckland. Earlier, the Kiwis went into the day struggling at 3-53 in 23 overs whereas Peter Fulton and Dean Brownlie were fighting at 14 and 13 runs respectively. The batsmen started off well by hitting a couple of fours each as Fulton was dropped on 31 by James Anderson at midwicket off Stuart Broad on the third ball of the 32nd over. Fulton availed the chance and hit another 2 fours in the 34th over as Dean Brownlie lost his wicket at 82 after scoring 28 runs. Brendon McCullum joined in next with Fulton who was furious against Monty Panesar in the 40th over while adding 14 runs with 1 six and 2 fours and completed his fifty as well. McCullum was doing fine at his end and the duo hit one six each followed by 17 runs in the 46th over with 2 sixes and 1 four from the two. The boundaries kept on flourishing from the woods of the two batsmen as Peter Fulton dispatched another six on the fourth delivery of the 52nd over to Broad and powered his second hundred in the same Test. The score was enhanced to 199 when Peter Fulton was caught by Joe Root at long on at the bowling of Steven Finn for 110 off 165 balls with 5 towering sixes and 14 fours. 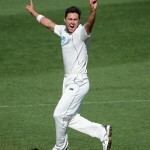 The new batsman, BJ Watling, continued with the rhythm as Brendon McCullum registered his 28th Test half century in the 54th over. The latter kept on enjoying his shots and got another 13 runs in the next over with 1 six and 1 four. Watling was gone for 18 whereas Brendon McCullum remained unbeaten on 67 from just 53 deliveries with 3 mighty sixes and 5 fours. The innings of the home side was declared at 241after 57.2 overs with four wickets still in hand. Stuart Broad and Monty Panesar were the top wicket takers with two each whereas James Anderson and Steven Finn shared one wicket each. The hosts set a target of 481 runs for the visitors to win the game in the possible 143 overs still left in the Test. England had a dreadful beginning of their second innings as Nick Compton was caught behind by the wicket keeper, BJ Watling, off Tim Southee for two mere runs. Jonathan Trott got together with his captain, Alastair Cook, and they started the repair work. The first hit 3 fours until the 11th over and Cook tasted his first boundary after 33 balls and they crawled to 50 runs in 19 overs. Jonathan Trott became the next victim at 60 after contributing 37 runs and was replaced by Ian Bell as both batsmen went back to their shells. The home bowlers kept on teasing the visiting batsmen who played a lot of maiden overs in the process. Kane Williamson struck twice in the dying moments of the game and put his team on the driving seat. He took the important wicket of Alastair Cook who scored 43 off 145 with 4 fours and removed Steven Finn for a duck. England managed 90 runs for the loss of four wickets in 52.1 overs at stumps on day four. New Zealand is in sight of a historical series victory whereas England faces a difficult task to save the match as they are still in a deficit of 391 runs. It will be a fantastic win for the Black Caps since they have never clinched a home series against England ever since 1983-84.